Tricky, isn't it? An assembly hall usually implies large groups of people, perhaps for music, dancing or other entertainment. Yet this little building looks more serious - religious gatherings? town hall offices? Yes ... it's an interesting one. 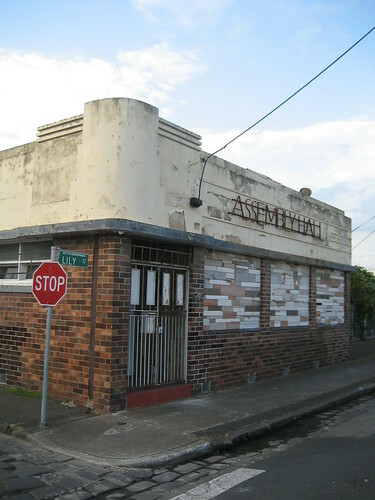 I've a feeling that it may have been a Jehovah's Witness Assembly Hall. I've a feeling I've seen a similar JW Hall somewhere on the east coast of Australia but it was years ago and before I was taking more of an interest in buildings. Thanks Helen. Another piece in the jigsaw. We'll figure out what it was one day. 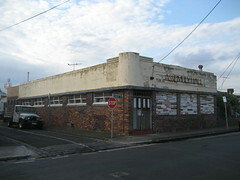 David-here is the definite answer to this building.It was once a Wine Saloon (no beer,fortified wines only),originally a wooden structure,but rebuilt in the early '30's in much the condition as it is now.When liquor laws changed in the 1960's it was sold and became a Jehovahs Witness Kingdom Hall.The blocked up windows are the result of the front windows being repeatedly broken by kids throwing rocks through them. The building was sold in the early '90's and the Jehovahs sign was replaced with the current one. Thank you Warren. You've completed the jigsaw. Great stuff.